By chance, I picked a copy of Emma Donoghue’s Room from our bookshelf at the end of last year. My wife had read and enjoyed the novel on publication and I knew that it had been a critical and commercial success, but I had felt no strong impetus to read it for myself until I found myself between books last December. And, in fact, I was gripped! I finished the book more or less in a sitting, admiring the bravura that allowed Donoghue to resolve her major conventional source of tension less than half way through, yet still keep the reader’s interest tautly wound up. Having remarked on the filmic nature of the novel, I have to admit that I had a few anxieties about seeing it on the screen. The main one related to Jack, the child narrator of the novel. However, this was something that need not have concerned me, as Jacob Tremblay’s performance was remarkable: an entirely natural, unforced portrayal of a five year old, responding believably to the extraordinary circumstances Jack undergoes. In fact the film’s perspective removes one of the few problems I found with the novel. During the reading, I frequently found difficulty in suspending my disbelief that a child of that age would recall conversations and interpret events in such a clear and mature way. Under the eye of the movie camera, this improbability disappears. Brie Larson, as Jack’s ‘Ma’ gives an almost equally impressive performance, especially given that the first half of the film is so claustrophobically focussed on the two of them. Relatively unknown in the movie world, though she has been acting since she was 9, the 26 year old conveys Ma’s desperate strength and determination as she schemes to preserve Jack and to escape. Necessarily unglamorous while in the ‘room’, she manages to convey an impressively convincing discomfort with the forced glamour of a television interview that painfully probes her experiences and motivations, pushing her to a suicide attempt. Such is the success of the two main stars of the film that actors of the quality of Joan Allen (The Ice Storm, the Bourne films) and William H Macy (Fargo, Magnolia) are effectively eclipsed, solid as their performances are. Author Emma Donoghue was involved in the film as screenwriter and executive producer, ensuring little compromise with the transition from the novel. The only significant hint of compromise I noticed was the downplaying of the fact that Ma continues breastfeeding Jack until well after their escape from captivity, something that is highly effective in establishing the bond between mother and child in the novel, but which would perhaps not have played well with US audiences. The other slight quibble is that the strength of Donoghue’s writing keeps the reader’s interest in the novel after the drama of the escape has played out. 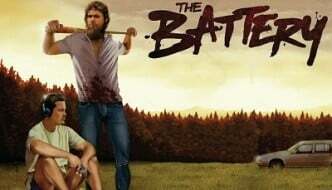 In the film, this option doesn’t exist…and although the family dynamics are handled sensitively and convincingly, as one would expect with character veterans like Allen and Macy on hand, there was an inevitable sense of the pace slackening. 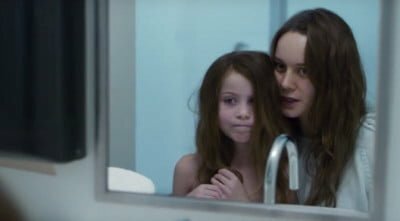 As director, Lenny Abrahamson handles the whole with assurance and a directness that might not have been expected from those who saw his quirky previous feature, Frank. 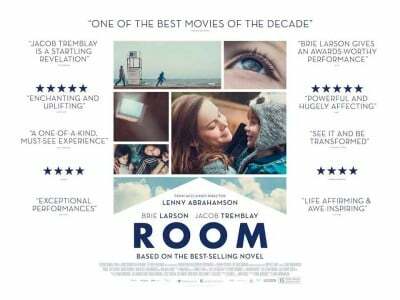 Overall, Room is a triumphant movie in its own right, lit up by remarkable lead performances and reflective of the novel’s phenomenal achievement of providing an uplifting story that never once flinches from the pain and degradation of the sordid scenario it explores. 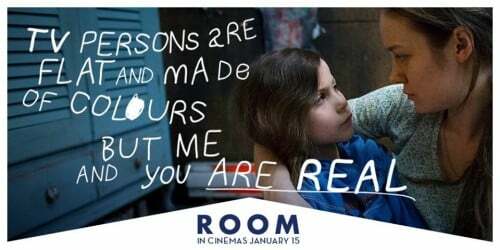 Room is on general release in the UK on the 15th January and you can catch it at the National Media Museum as well.